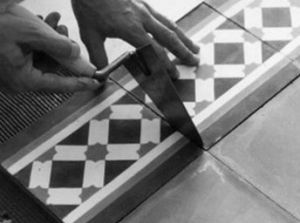 First, the floor tiles should be laid dry to achieve a perfect match of the subtle variations and harmony in the tone of the colors. 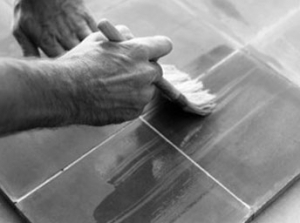 Wet the tiles to clean and remove any dust. 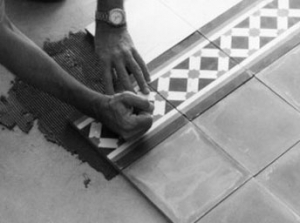 Lay the tiles on a screed of light mortar (150 kg/m3). 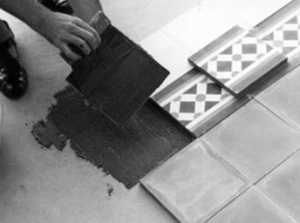 Place then directly on the screed and level with minimum pressure. Do not use a hammer to level them. We recommend the use of a large diameter wooden mallet. 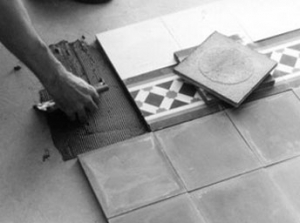 To provide our customers with a quality service, La Cimenterie de la Tour offers its range of products for the treatment of cement tiles. 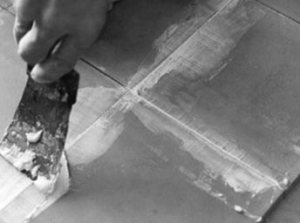 It is preferable to start any treatment a minimum of one week after installation in the case of laying with cement glue, and one month in the case of laying with screed, so that the phenomenon of carbonation giving a whitening appearance has completely ceased . This period may be longer (see the general conditions of sale). It is important to wear rubber gloves, goggles and masks for the application of different products. Use a product suitable for this kind of operation. These products are sold in more or less high concentration according to the brands. 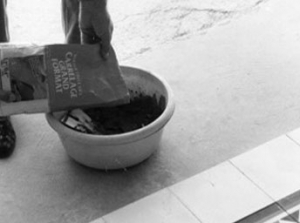 La Cimenterie de la Tour uses Cement Tile Cleaner, diluted up to 30% for 1 liter of water (ie 300 ml of cleaner for 1 liter of water) and applied using a bridge washer. Leave on for 5 to 10 minutes then rinse with clear water with a clean mop. The cement laitances will thus be eliminated chemically by the acid solution and the friction of the brush. 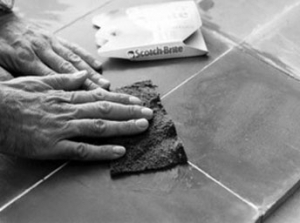 Brushing will make the tile surface smoother and softer, making it easier to maintain. Allow to dry for a minimum of 24 hours. THE CLEANER MUST BE USED ONCE ONCE! If the white traces persist, use fine sandpaper (bodyshell paper) or Scotch Brite. It is imperative that the soil be clean and dry (check with a moisture tester, the tarpaulin control is prohibited) before starting step 2, make sure that the soil is clean. Make sure the floor is clean, dust-free, dry and free from grease and moisture. 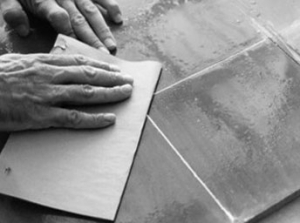 Apply a first coat with a new window moistener, allow to dry for 4 to 6 hours. 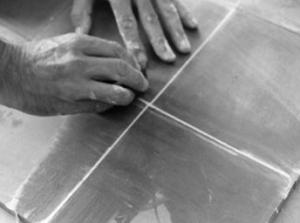 Once the soil is perfectly dry apply a second thicker cross coat, allowed to dry for 4 to 6 hours. Ensure a good distribution and there is no surplus. A 1 liter can will cover between 10 and 12 m². After drying for 48 hours at 20 ° C you can put your floor back into service or finish for a satin finish and easy maintenance. Pour 2 to 3 caps of shampoo into 5 liters of hot water. Wash your floor with a mop or a wrung out mop. Do not rinse, allow to dry. It is useless to rub. With neutral non-acidic cleaning products (eg Marseille liquid soap). We advise you to clean from time to time with the shampoo waxing your floors will skate over time. IMPORTANT: Do not wash with black soap that contains linseed oil before treatment. This would be catastrophic because the pores of the tiles are immediately clogged with linseed oil. 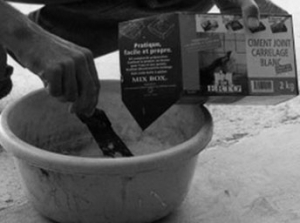 In this case, it will be necessary to always use black soap for the maintenance of this soil!